Souplantation Sweet Tomatoes brought about healthy and delicious dinning ideas in the region of San Diego, on 1978. They are credited to be the initial brand for casual eatery. They used to serve fresh food and have wholesome menu. In 1983, Michael Mack founded Garden Fresh Restaurant Corp., by acquiring the initial two restaurants of Souplantation. After this, they began to expand their reach beyond the markets of southern California. The name, Sweet Tomatoes was incorporated at a later period in order to spice up the brand and include wholesome and fresh ingredients to the existing menu. They have their business spread over fifteen states with about 112 restaurants owned by the company. There are currently 0 consumer reviews about Souplantation Sweet Tomatoes available. Share your review. Please take a note that you are about to post a public review about Souplantation Sweet Tomatoes corporate office on CorporateOffice.com. This review will be public, so please do not post any of your personal information on this website. 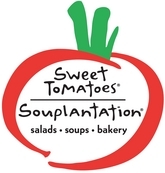 If you would like to contact the corporate offices of Souplantation Sweet Tomatoes, please use their contact information such as their phone number, website, and address listed above to contact them. However, sometimes staff from Souplantation Sweet Tomatoes headquarters do read the reviews on this website.